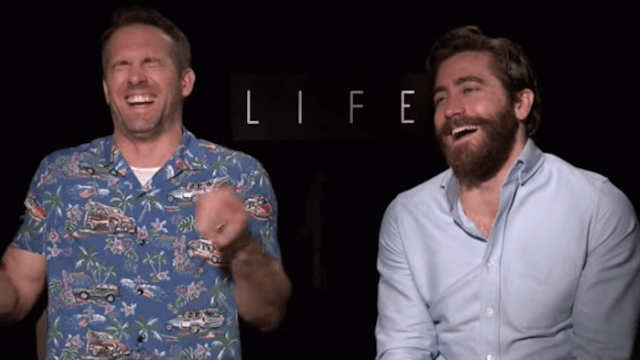 Watch Ryan Reynolds and Jake Gyllenhaal giggle their way through an interview. If the correspondent interviewing Ryan Reynolds and Jake Gyllenhaal in this video hoped to get anything useful or serious out of the interview, he's screwed. If, however, he was hoping to interview two laughing lunatics, he's in luck, but that's just what new BFFs Reynolds and Gyllenhaal turn into about five seconds into the interview. Ryan Reynolds and Jake Gyllenhaal are officially promoting their new sci-fi movie, Life. Unofficially, they are promoting their bromance, which is on full display here.